Applying for a PRC exam or license? We'll guide you through the PRC online registration and application process. 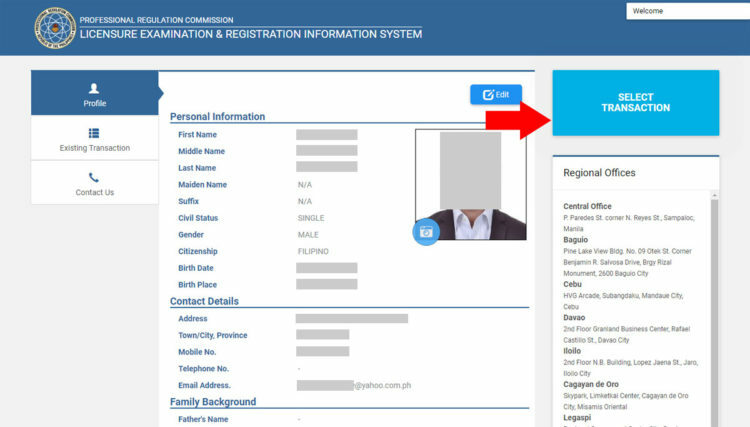 The Professional Regulation Commission (PRC) has started implementing the Licensure Examination and Registration Information System (LERIS) for the processing of examination applications, initial registration for the issuance of licenses, and license renewals. 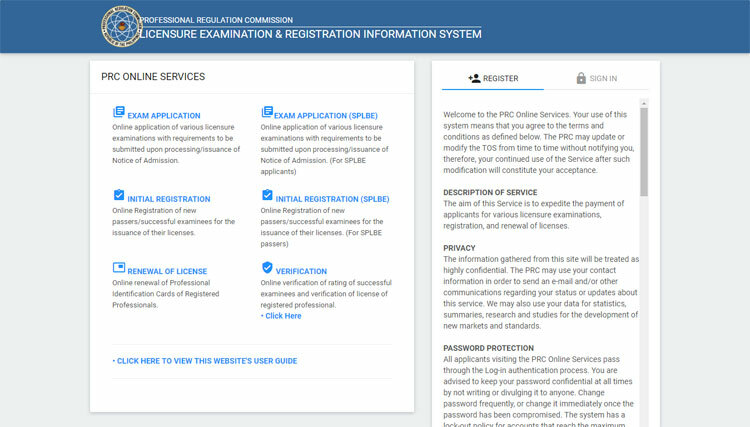 In this guide, we’ll navigate you through the procedures and steps in PRC online registration and PRC online application so that you can apply for exams and get your licenses. 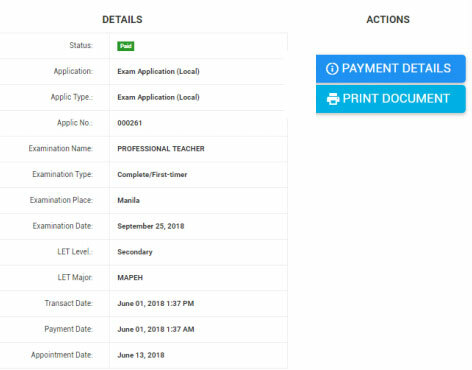 Examination – Online application of various licensure examinations with requirements to be submitted upon processing or issuance of Notice of Admission. Initial Registration – Online registration of new passers and successful examinees for the issuance of their licenses. 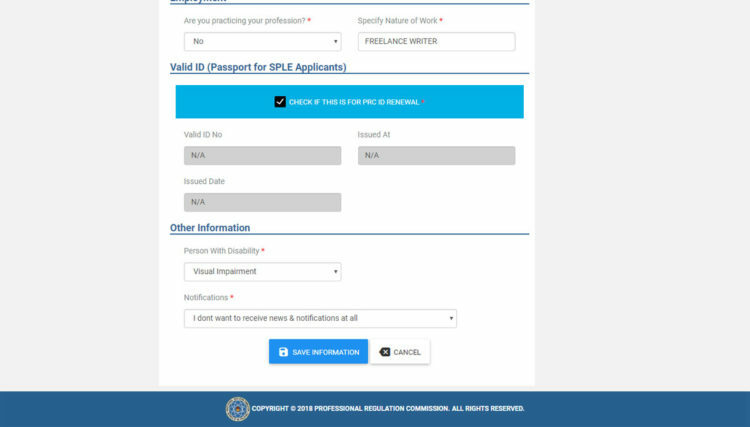 Renewal – Online renewal of Professional Identification Cards of registered professionals. Duplicate – Online application for lost ID replacement (coming soon). Certifications – Online application of certifications (coming soon). 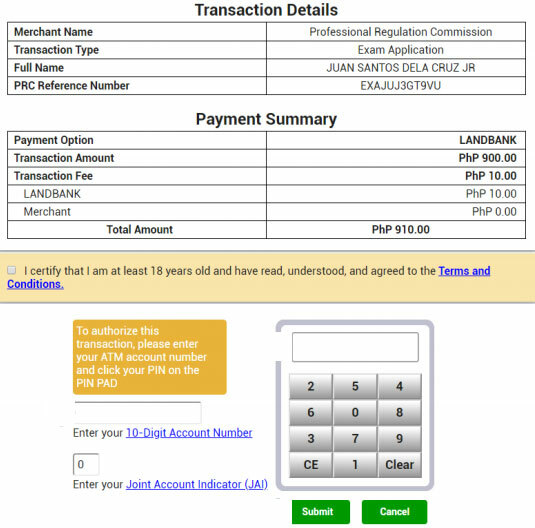 Now with these requirements ready, let’s begin the PRC online registration process using PRC LERIS. 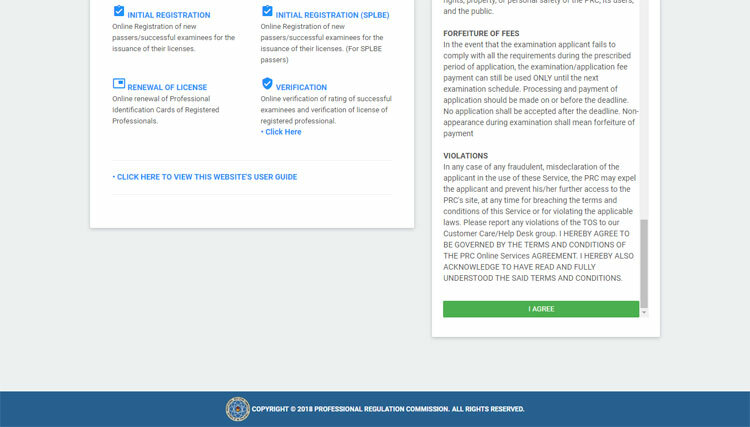 Step 1: Visit the PRC LERIS website at http://online.prc.gov.ph. 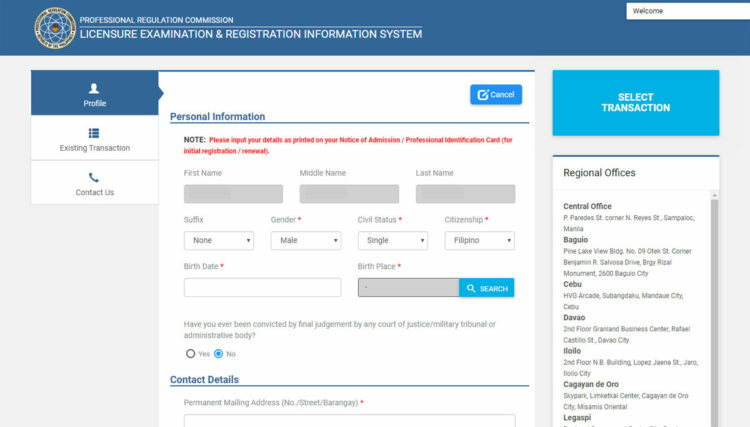 If you have an account with the old system at www.prc-online.com, please note that your account is no longer active and so you have to register a new one. Step 2: Read the terms and conditions on the right-hand portion of the screen. Scroll down to the bottom until you see the green I AGREE button, then click that button. Step 3: Enter your details as printed on your Notice of Admission or Personal Identification Card. Click the REGISTER button once you’re finished. Your password must be at least 6 characters long and must include at least 1 letter, 1 number and 1 special character. Step 4: On the next page, you can enter or edit your personal information. Aside from the details that you entered in Step 3, you will need to provide your permanent mailing address, mother’s name and citizenship, name of school, degree/course, date of graduation, valid ID, and other important information. Don’t worry if you make some mistakes or omit some information. You’ll have the chance to review and edit your information on the next page. Step 5: Click the SAVE INFORMATION button after filling out all the required information. 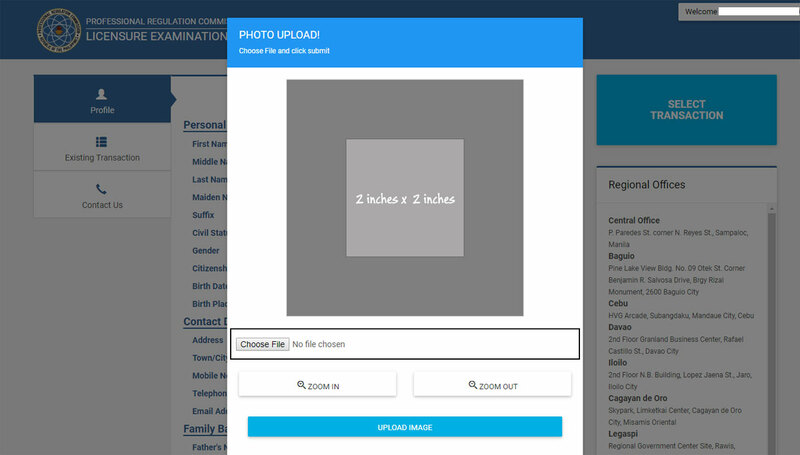 Step 6: In this step, you will upload your ID photo. Click the blue round icon as shown on the screenshot below. Step 7: Read the photo requirements. 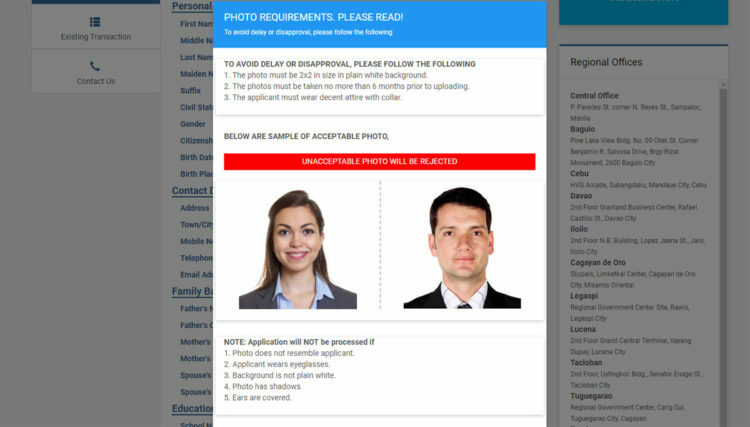 Your ID photo must be 2″ x 2″ in size with plain white background and must not be taken more than 6 months before. Click the PROCEED button. Step 8: Click the Choose File button and look for the .jpg file of your photo. Select the file and click Open to upload the photo. Then click either the ZOOM IN or ZOOM OUT button to fit the photo to the light grey box as shown below. Click UPLOAD IMAGE once you’re done. Step 9: Click SELECT TRANSACTION. This will launch a popup screen showing several transaction types. Step 10: Choose your transaction, whether it’s examination application, initial registration, or PRC ID renewal. Step 1: Enter the information with regard to your transaction. For PRC online application for licensure examination, enter the name of examination, examination type, date of exam, and place of exam. 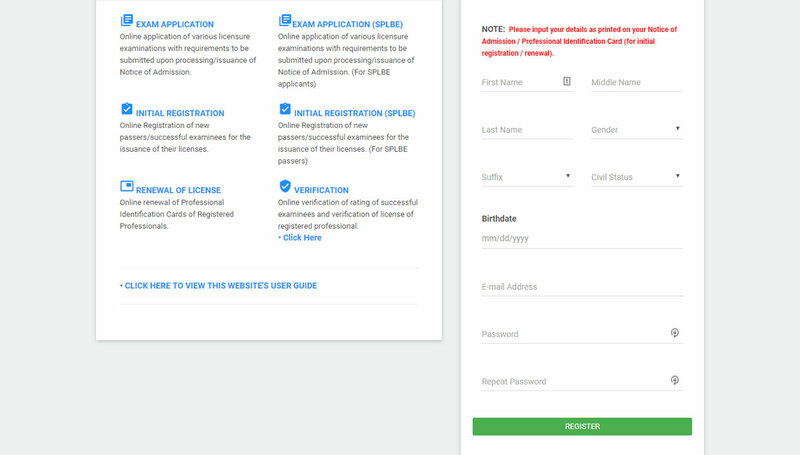 For PRC online registration of new passers for licensure issuance, choose your profession and enter the application number from your Notice of Admission (NOA). For PRC online renewal of Professional Identification Cards, select your profession and your PRC license number. Click the PROCEED button once you’re done. Note: Some of the screenshots below will show different information depending on your transaction type. 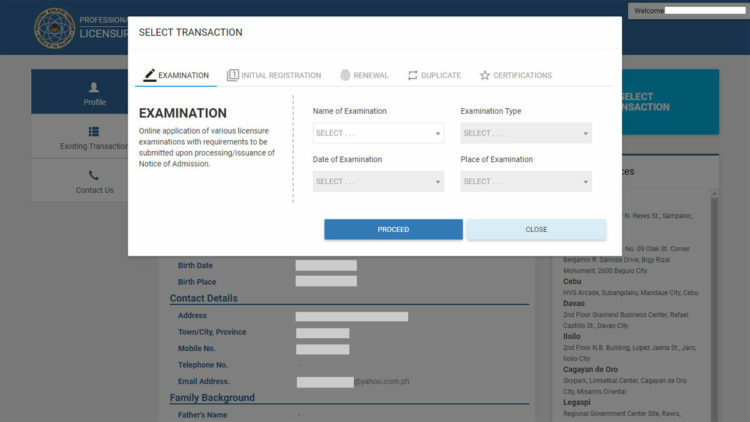 For brevity, we’ve only included screenshots for the examination transaction. However, the steps and processes will also apply for other transactions such as the initial registration for new passers and the PRC ID renewal. Step 2: Select your preferred PRC Regional Office. Click PROCEED. Step 3: Choose your payment option and click Submit. Step 4: Review your transaction summary and click SUBMIT. Enter your 10-digit ATM account number and click your PIN on the PIN pad. Click Submit. 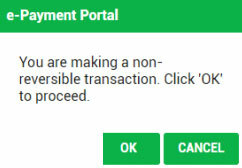 Step 6: Click OK to proceed with your payment. Step 7: Click Print to print your transaction details or OK to proceed. 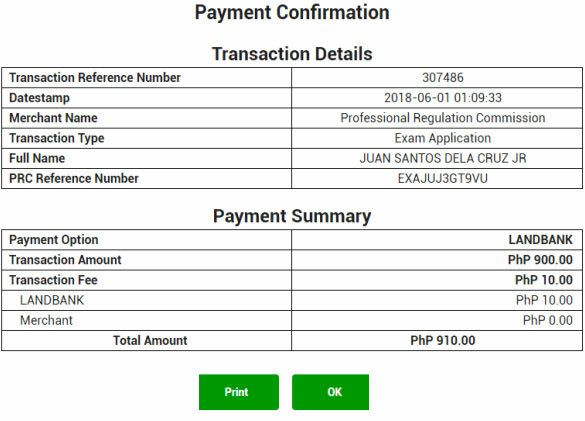 Step 8: You will be shown if your payment is successful or not. If payment is successful, click GO BACK TO PROFILE. 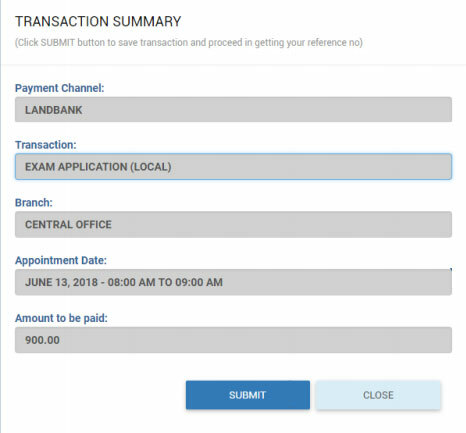 Step 9: To print your PRC online application form, click the Existing Transactions button on the left side of your profile page, choose the transaction, and click the PRINT DOCUMENT button. 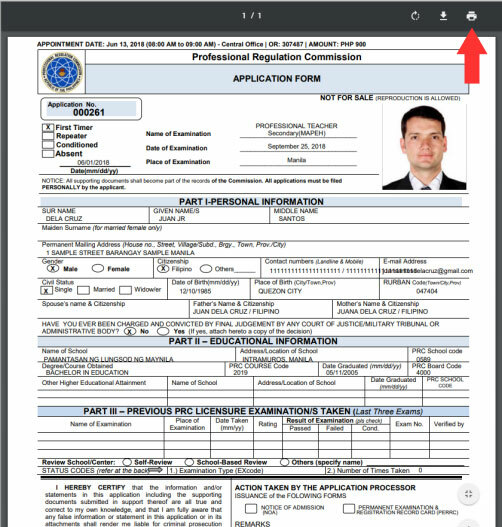 Step 10: Print the form by clicking the “printer” icon indicated by the arrow on the screenshot below. Step 11: Log out from your computer by clicking your name on the top-right portion of the screen and then clicking Logout. This is important if you are using a public computer at a library or Internet shop. Step 12: Proceed to your chosen PRC Regional Office or Service Center at the given appointment date and time to submit all the required documents. 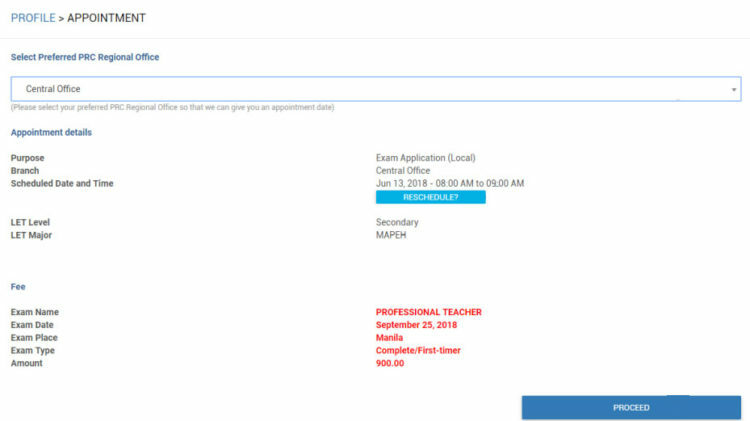 Click here for a list of required documents (for examination only). Don’t forget to bring your printed PRC online application form. We hope that you find this guide useful for your dealings with the Professional Regulation Commission. We’ll update this guide from time to time for any significant changes in the PRC online registration and application process. If you have any questions or clarifications, don’t hesitate to post a comment below and we’ll try our best to answer.